The new ATV Pro Racing status elevates the sport to the professional level of racing enjoyed by AMA Motocross, AMA Supercross, AMA Suberbike, AMA Supermoto, and AMA Flat Track. The American Motorcyclist Association (AMA) has announced the "AMA TrackSmart Series: Strategies, Safety & Success," a new conference series designed to benefit and educate organizers of motorcycle and ATV competition. The most exciting news is the evolution of the AMA Pro ATV Championship. 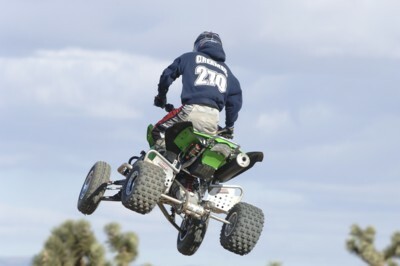 Since its inception, the ATVA nationals have showcased its fastest and best riders in the “Pro Class”. The Can-Am ATV Grand National Cross Country Series returns to television sets around the country this spring with weekly shows on Versus (formerly Outdoor Life Network) beginning April 14th. Team Suzuki /Yoshimura announced today that it will defend its WPSA title with two new program partners in 2007- MSR and Pro Taper. Honda’s popular Red Rider Rewards program returns to the 2007 AMA Grand National Cross Country Series in a big way, with contingency available for both bike and ATV racers as well as an unprecedented $25,000 GNCC Overall Championship Bonus on the line for two and four-wheeled pro racers (XC1 Pro class). Long-time GNCC supporter Kawasaki Team Green has upped the ante for racing contingency programs, as their 2007 GNCC contingency payout for bikes and ATVs totals a whopping $530,950. That’s the largest combined total in the 2007 GNCC Series. Monster Energy Kawasaki Racing Team will look to the all-new 2008 KFX®450R racing ATV and three experienced riders as the keys to bringing home a championship in 2007. The WPSA PowerSports ATV Tour will sanction 27 Pro, Pro Am, Youth and Amateur classes during the 2007 ATV racing season. Due to an overwhelmingly positive response, the Tour has added the Pro SuperSport “UTV” class to its Pro lineup, which also includes the popular SuperQuad Pro 450 MX and the Pro Stock QuadTerrain Challenge classes. The WPSA PowerSports ATV Tour has unveiled its PowerSports ATV Rewards Program for 2007. The Program, which is open to all racers who competed in at least two events during the 2006 season, features a discounted membership price, as well as a “Buddy Program” to reward last year’s racers.